This collapsible warning line system is a great alternative to traditional perimeter warning systems that are less easy to break down and set up. The W00150 provides roofers with simple set up to alert crews during work that they are approaching the roofs edge. The added benefit that the system folds down for easy storage means transport and storage are a breeze. Traditional Warning Line System parts are separate, with the base plate and pole not attached. This can ultimately lead to mis-placing important pieces to the system! With the W00150, the base plate and the stanchion are welded together. The way that the weld is fabricate allows this unit to folds into a single, compact linear unit. The light weight makes carrying and set up simple, and you don’t need any extra hardware in order to assemble – Essentially this is an all encompassing kit to allow for fast and economical perimeter safety. Order the W00150 Complete, Collapsible warning line system and you receive 100 feet of pennant line, built to be heavy duty and withstand weather as well as jobsite abuse – And then also the four stanchion / base combinations. Set up fast, and put your fall prevention plan into place on every work site. Intech Equipment and Supply provides a host of fall protection, fall prevention, and general safety equipment by Cleasby as well as other top industry manufacturers. Work with our experts to outline an equipment line up that fits your crew size and stays within your budget. Call us today to place your order for the Complete Collapsible Perimeter Warning System, or browse our online store to see the Cleasby alterative. 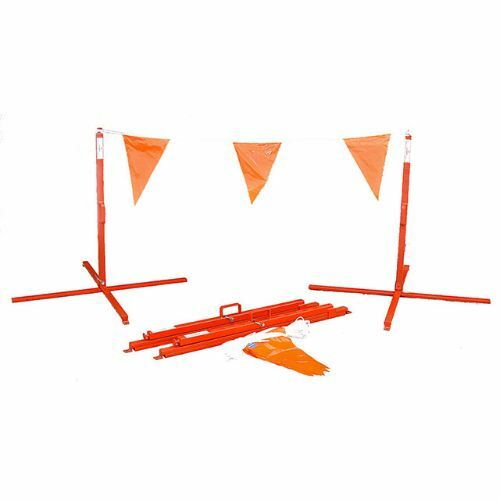 The comparable W00050 Perimeter Warning Line System includes the same count for poles and posts, but separate pieces are also available for purchase to offer a completely customized set up.